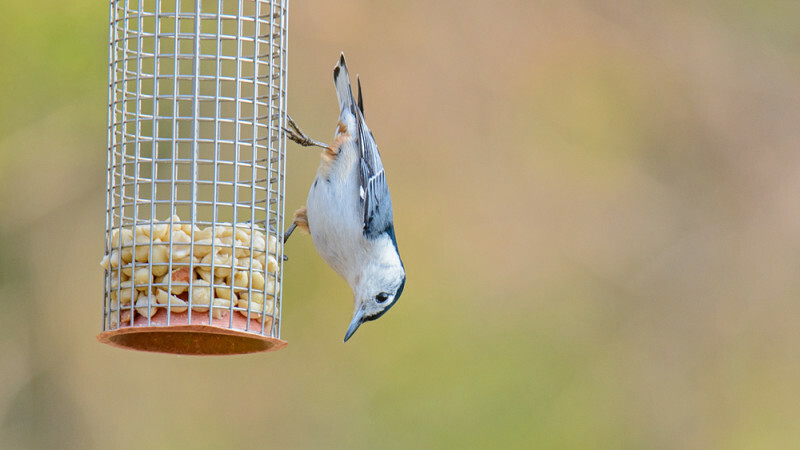 May is known as the best month for birding in the eastern part of the United States, and in particular for the spectacular spring migration that occurs during this time period. This truly fascinating phenomenon is perhaps most obvious along the shores of the Great Lakes, where the migrating passerines gather in large numbers before eventually moving across (and sometimes around) the Great Lakes on their journey northwards to their breeding grounds. A few sites have over the years developed such a great reputation as being migrant hotspots that they attract birders from all around the country to experience this spectacle. One sight in particular, Magee Marsh in north-west Ohio, receives the most attention. In line with this, a festival, The Biggest Week in American Birding, was put in place to not only commemorate this spectacle but also to promote it. The Biggest Week in American Birding has become synonymous with friendly people, great company, and some of the finest birding out there. For ten days, and many more on either side of the festival, birders gather here and thoroughly explore the region, trying to track down the many avian delights that move through on their northbound journey. The festival is strategically timed during the first half of May to give the birders attending the best opportunity to experience this amazing spectacle. 2016 marked the second year that Birding Ecotours has attended ‘The Biggest Week’, this time represented by owner Chris Lotz and tour leader Dylan Vasapolli. Both Chris and Dylan live in Johannesburg, South Africa, and after a long-haul flight arrived in the US on the 4th of May, just before the start of the festival. After Chris and I arrived in Columbus, Ohio, good friends Bill and Mary Heck shepherded us off to the nearby Grange Insurance Audubon Centre. We spent a bit of time birding around the centre and getting reacquainted with a few of the North American species, such as Field, Song, White-throated and White-crowned Sparrows, Rose-breasted Grosbeak, Wood Duck, Brown Thrasher, Wood Thrush, Baltimore Oriole, and the first of many wood warblers, namely Cape May, Black-and-white, Tennessee, Nashville, Palm, Myrtle, and American Yellow Warblers and Northern Parula. After spending the night with friends in Columbus we headed northwards to check in for The Biggest Week, based at Maumee Bay Lodge on Lake Erie. After completing all formalities we headed off to Magee Marsh to see what was around. Over the course of the coming ten days we would spend many an hour walking, exploring, and birding around Magee Marsh. Chris and I were also scheduled to lead many of the walks in the morning around the greater Magee Marsh area. Aside from Magee, we birded north-west Ohio relatively well, with visits to the well-known Oak Openings Preserve Metropark, Pearson Metropark, Ottawa National Wildlife Refuge, Maumee Bay State Park, and Metzger Marsh Wildlife Area, along with a few other sites. Oak Openings, in particular, is always a massive hit as it gives one a taste of some of the fine birding that can be had away from the shores of the Great Lakes and their amazing migration spectacle. This relatively large area is easily accessible, and a lot of ground can be covered on foot. 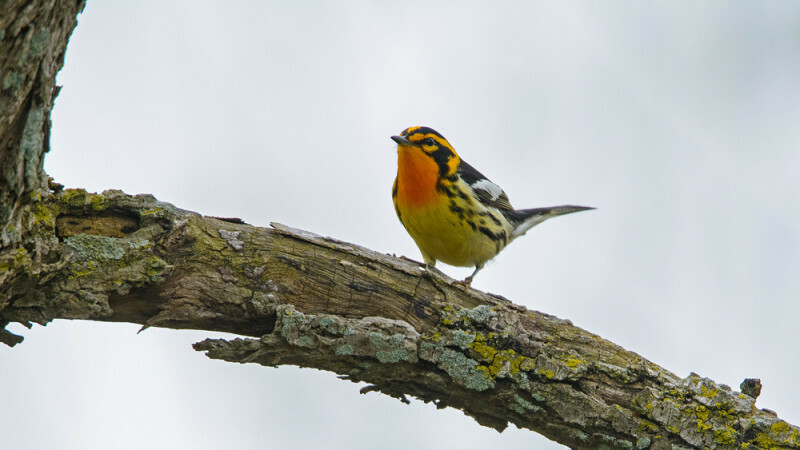 Some of the key species occurring within the preserve are Lark Sparrow, Blue Grosbeak, Red-headed and Pileated Woodpeckers, Yellow-breasted Chat, Blue-winged Warbler, Summer Tanager, and Henslow’s and Grasshopper Sparrows. On our two visits to this preserve (one of which was leading a van trip), both proved too early for Blue Grosbeak, while Yellow-breasted Chat remained conspicuously absent and Henslow’s Sparrow refused to show, but otherwise we did well and had multiple, and good views of the remainder of the ‘specials’. Lark Sparrow, in particular, we managed to get in a number of different places, with our best sighting coming in the so-called Tornado Alley (through which, as its name suggests, a tornado moved some years ago, leaving nothing but dead trees and open land in its wake). The open land between all the bare trees had been recently burnt, and we found a small group of three Lark Sparrows foraging among a group of female Red-winged Blackbirds. The birds were completely relaxed and came within 15 feet of us, occasionally disappearing out of sight between the grass tufts. 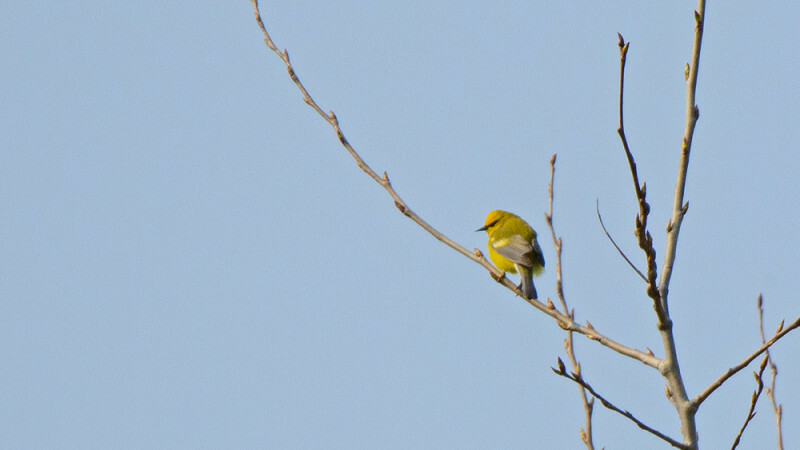 We also had simply sublime scope views of a stunning Blue-winged Warbler, as it remained content to stay on the same perch, happily singing away, for all in my group to see. 30 minutes prior this was not the case, however, as we could hear a bird call every now and again, and, try as we might, we just simply could not lay our eyes on it. As these things go, we had given up, said we’d try for another bird at a different spot, and were busy watching some nesting Northern Flickers, when the Blue-winged Warbler started singing again, this time incessantly and from right above our heads. Within no time we had the bird pinned down, scope on it, reveling in its beauty. 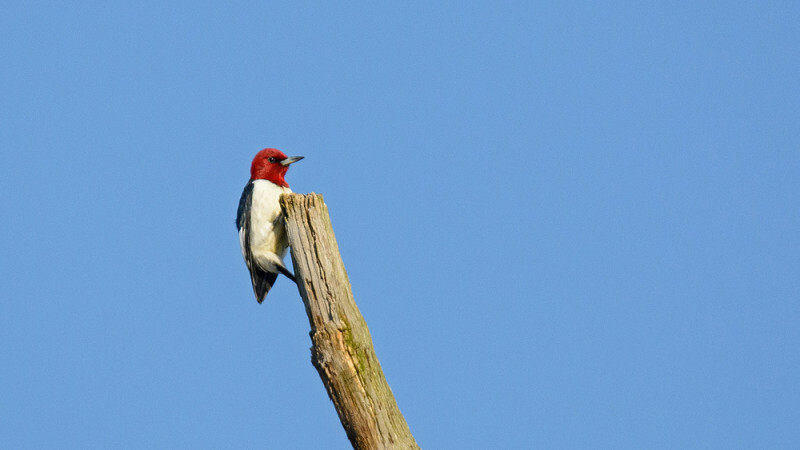 The many Red-headed Woodpeckers are also true crowd pleasers, and the Tornado Alley area in particular is a hotspot for them, as groups of birds move around the dead trees, chasing one another, occasionally pausing to give their onlookers crippling views! Aside from these species, the preserve plays host to many other species, and we enjoyed the likes of White-breasted Nuthatch, Hairy Woodpecker, a nesting pair of Northern Flickers, Great Crested and Least Flycatchers, noisy Yellow-throated Vireos, Brown Thrasher, Eastern Bluebird, Pine Siskin, Eastern Meadowlark, Indigo Bunting, Eastern Towhee, and a reasonable selection of some of the wood warblers, most notably a few Ovenbirds skulking within the woods. Metzger Marsh was another site we visited a few times during the course of the festival, and while the wetland section had a massive amount of water in it (compared with last year, when the water was much lower and there were a few mud banks around), the woodlot on the lake shore proved productive on a few occasions. Despite the high water levels we still managed to eke out a Willet sitting precariously atop some floating vegetation, but other than a Lesser Scaup we didn’t have much reward when it came to the water-associated birds. 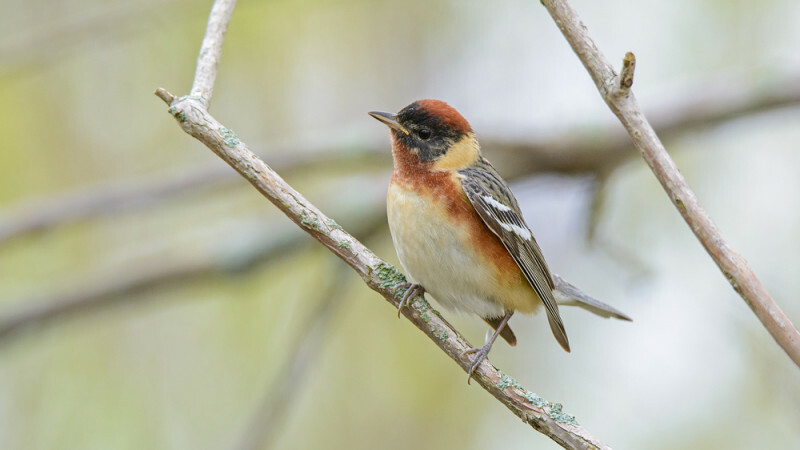 Migrant passerines are the main focal point at the woodlot, and due to the small size of the woodlot it is a site that you can bird thoroughly! We enjoyed a healthy complement of wood warblers on this site, most notably Blackburnian, Bay-breasted, Wilson’s, Magnolia, and Blackpoll Warblers and Ovenbird. The Ovenbird, in particular, was most interesting. We spent some time watching it walk around, as they do, very typically along the ground, over logs and between plants, when all of a sudden it flew up to the lowest branch of a large tree around 15 feet off the ground, before continuing up and up and eventually out of sight in this large tree. 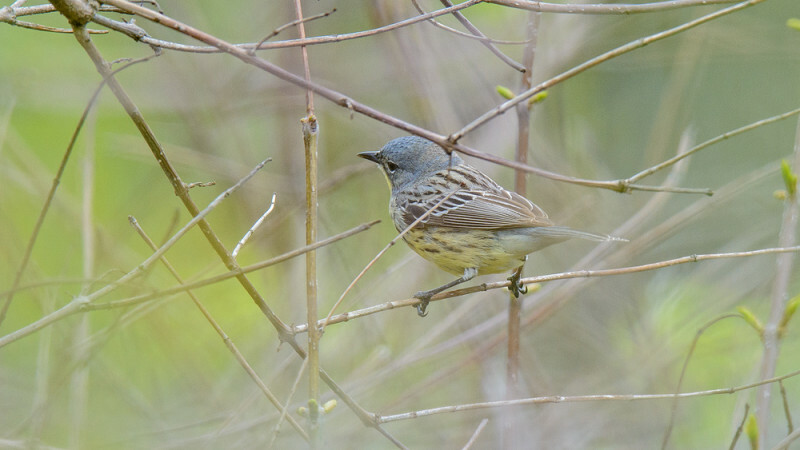 We also spent some time watching countless Nashville Warblers coming down to drink at a small puddle in the woods, where they would take a few sips before continuing back into the trees. Least Flycatchers were rather prominent here, and most visits were not complete without a few of these. Sandhill Cranes were regular in the area, and we were privy to groups flying over on a few occasions. With the festival being based at Maumee Bay Lodge, the area surrounding the lodge was also thoroughly birded, and the Maumee boardwalk received its share of birders. Although this particular boardwalk is not quite as productive as its more famous cousin at Magee, it still hosts its own suite of great birds. 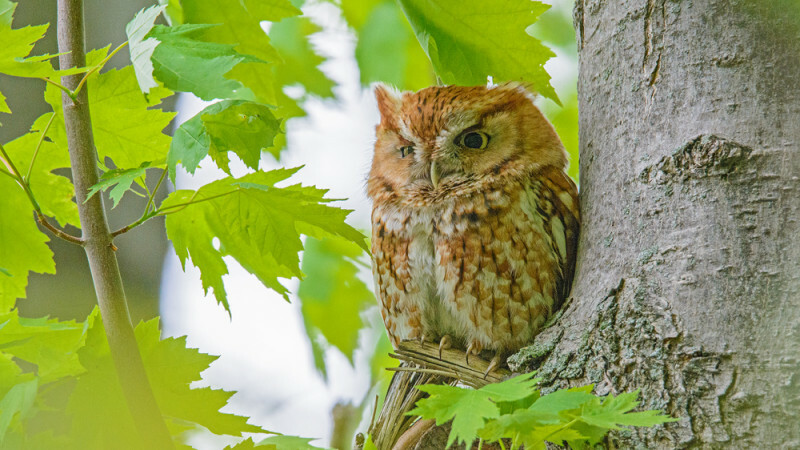 There are a few resident Eastern Screech Owls that occupy a few of the nest boxes, and it is a great place to get familiar with both the grey and rufous forms of this small owl. Swamp Sparrows move about between the, well, swampy bits along the boardwalk, and the open areas between the swampy bits proved a thrush magnet, with sightings of Swainson’s and Grey-cheeked Thrushes and Veery. A grove of trees running through the middle of the boardwalk produced a steady stream of migrants over the festival. Here we enjoyed great looks at multiple groups of Scarlet Tanagers and a few Great Crested Flycatchers, along with a single Philadelphia Vireo and a lone Acadian Flycatcher. On the warbler front, American Redstart and Magnolia, Black-and-white, Chestnut-sided, Orange-crowned, and Black-throated Blue Warblers showed particularly well! Toward the beginning of the boardwalk, right on the edge of the grove of trees, however, was truly ‘the’ place. Here a wide diversity of warblers moved through daily, and within a 10-minute period one day we notched up over 18 species of wood warblers at this site. 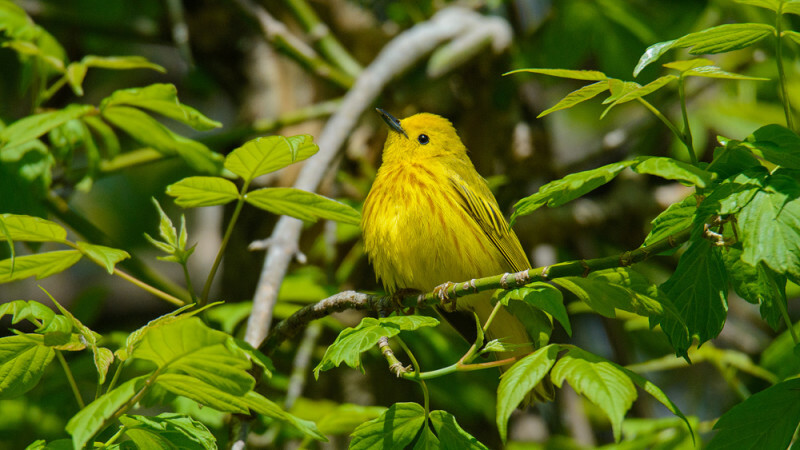 The site popped onto the scene after sightings of Kentucky and Worm-eating Warblers one particular morning, and it received a steady stream of birders from then onward. 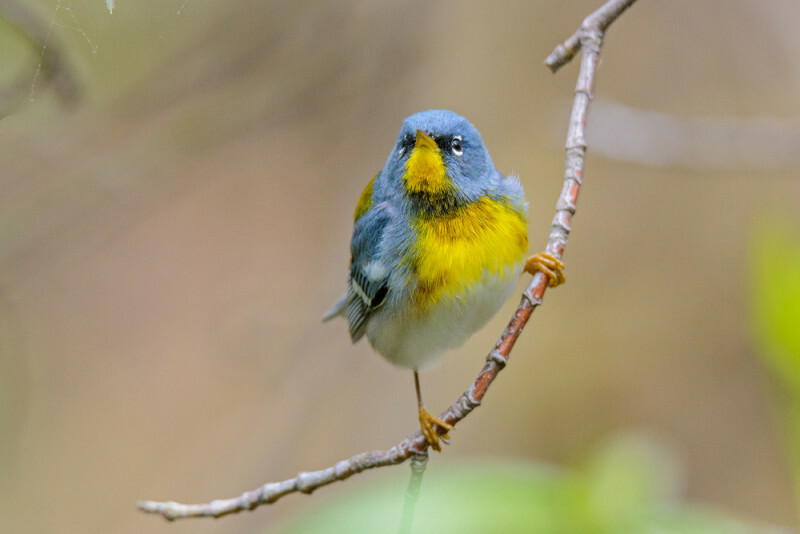 Not to be outdone, both Cerulean and Golden-winged Warblers showed in this area over the course of the rest of the festival. Although we didn’t see any of these species in particular, the sight became a favorite of ours. Bay-breasted, Chestnut-sided, Blackburnian and Blue-winged Warblers were some of the ‘regulars’ here. A flowering tree drew in a steady stream of birds, foraging quickly as they moved through, along with regular Ruby-throated Hummingbirds. Moving away from the Maumee boardwalk, the nearby pond was also a hit with a decent gull/tern roost complete with Bonaparte’s Gull and Forster’s Tern. Sadly, however, besides Canada Goose and Mallard the only waterfowl we managed to get here were two Lesser Scaup, while the sandy edges of the pan held a few Buff-bellied (American) Pipits. On a quick walk around Chris also managed to stumble into a skunk foraging between the bushes! Situated adjacent to Magee Marsh is the rather large Ottawa National Wildlife Refuge. Besides a few ‘peripheral’ visits we only birded this site properly once. Our other visits were mainly on a quick lunch run, a twitch (or two), and a bit of free time after the talk I gave on ‘Birding off the Beaten Track in Africa’. The main ‘wildfowl’ birding here was a little slow, with neither the numbers nor the diversity we were expecting. Snowy Egret probably was the most interesting wading waterbird, and several stunning Blue-winged Teals the most interesting duck species. The smaller shorebirds, however, were probably the most interesting, with good numbers of both Lesser Yellowlegs and Dunlin (well into the hundreds). There were smaller numbers of Solitary and Least Sandpipers and Semipalmated Plovers, while our two twitches were after Pectoral and Baird’s Sandpipers. The Pectorals were rather showy on one particular day, and, with around five different individuals to choose from, we had good views of this species. The Baird’s was a little trickier, and after some scanning we eventually got onto it and enjoyed some good comparative views with both Least Sandpipers and Semipalmated Plovers. 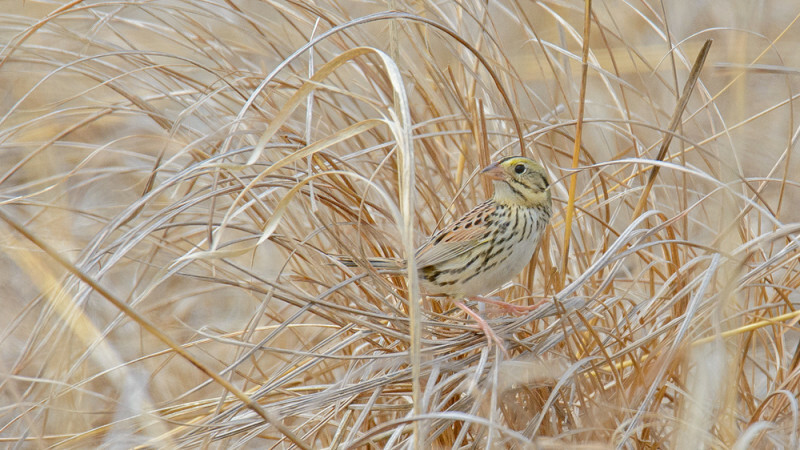 Aside from the wetland birding we also spent a bit of time tracking down Henslow’s Sparrows at the Adam Grimm Prairie. We had heard they had been reported here, and during one midday break we quickly shot out, knowing full well that the best time had passed and we probably wouldn’t have any luck. Fortunately, the weather was on our side with some pleasant overcast conditions. We got off to a good start when we managed to flush a likely candidate from the trail, and, after a bit of time, picked up a bird calling from close by. A few minutes later we had the bird in view and were enjoying some crippling views of it calling from the top of a clump of grass! A displaying Horned Lark was the only other bird of interest here. The famous Magee Marsh is the main site that attracts the great masses of birders, and this is also where we spent the majority of our time when not at any of the sites mentioned above. On many mornings we both lead walks around the Magee Marsh area, which were always good fun, getting many excited birders onto the colorful denizens that move through. Due to the large number of birders present, Magee is thoroughly birded, and virtually everything that is around is seen by someone, and news is circulated quite quickly. Magee has essentially two main areas to bird, firstly the very well designed and positioned boardwalk, and secondly the Estuary Trail. The Boardwalk passes through both more mature stands and larger stands of trees, and as a result usually delivers more, both in species and numbers. The Estuary Trail however, is not to be underestimated and has had its share of great birds and high numbers, and with far less traffic than the boardwalk it is an always inviting option. The days in late April, prior to the festival, are filled with the earlier migrants, which are not normally around when the festival begins. These are mainly Hermit Thrush, Dark-eyed Junco, Winter Wren, Golden-crowned Kinglet, and Clay-colored Sparrow, among others. In comparison with last year’s event, when virtually none of these were present, this year’s migration seemed slightly delayed, with good numbers of both Hermit Thrush and Winter Wren still in evidence at the start of the festival. The wood warblers were well represented during the course of the festival; however, the big pushes only really started coming through midway through the festival, from roughly the 8th/9th of May onwards. 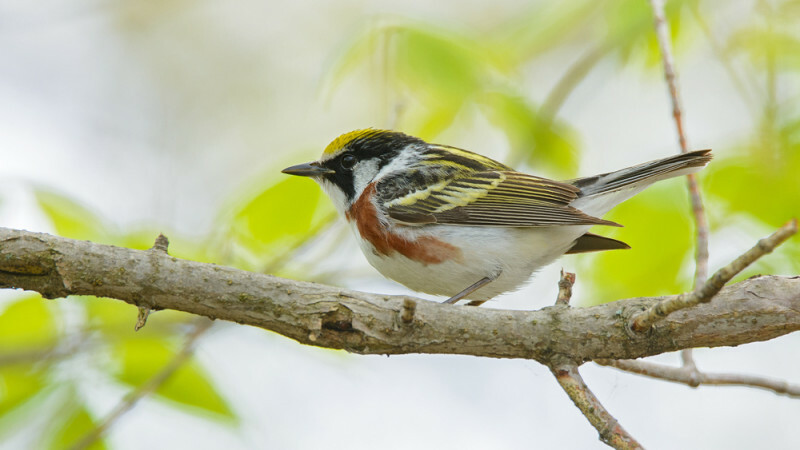 The early days were filled with numbers of American Yellow, Myrtle (Yellow-rumped), Black-throated Green, Nashville, and Palm Warblers, together with smaller numbers of a few other species, such as Orange-crowned Warbler, Black-and-white Warbler and Northern Parula. Ruby-crowned Kinglets were also around in force. After the first big push arrived the area was flooded with numbers of Magnolia, Chestnut-sided, Black-throated Blue, Bay-breasted, Blackburnian, Tennessee, and Cape May Warblers and American Redstarts. 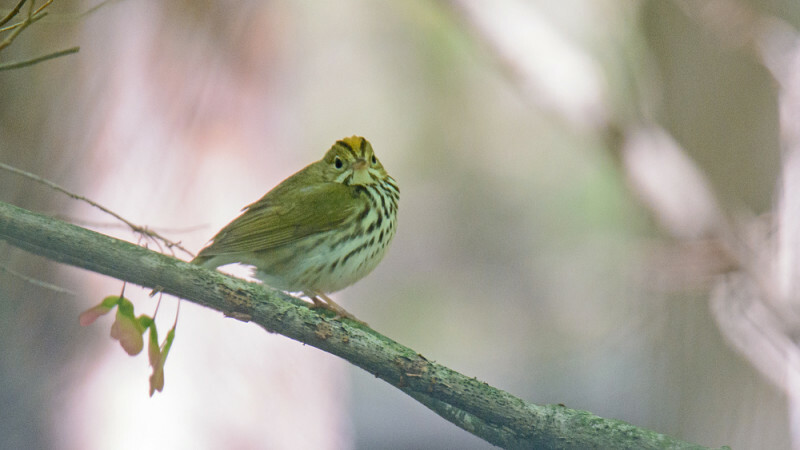 Ovenbirds made appearances here and there, as did the skulking Northern Waterthrushes, secretive Canada Warblers, and feisty Hooded Warblers. 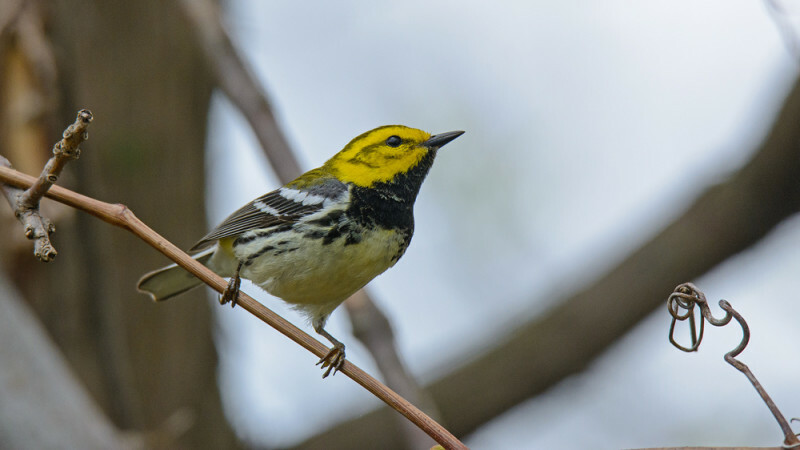 Towards the last few days of the festival both Blackpoll and Wilson’s Warblers began to move through in numbers, while Mourning Warblers were difficult as ever to see. 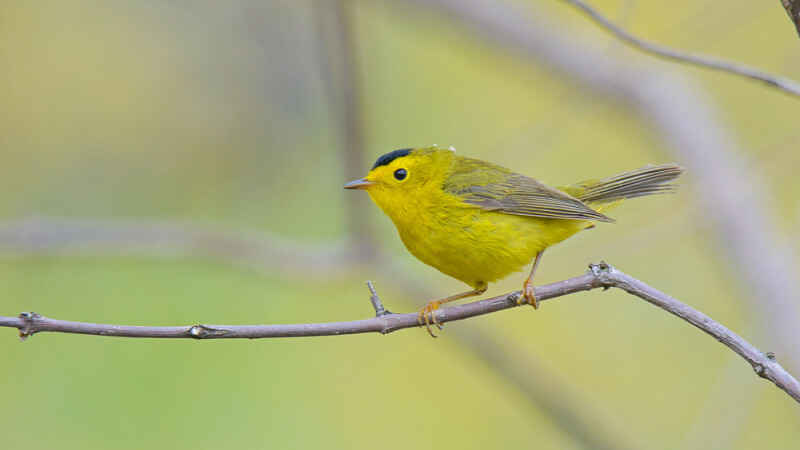 Blue-winged, Golden-winged, and Worm-eating Warblers were reported very occasionally. At the close of the festival the first of the Connecticut Warblers were seen, showing that later migrants were now pushing through. Sadly Connecticut Warbler remained off both mine and Chris’ lists, and we’d have to wait until next year to try for this skulking warbler. A particularly special sighting was that of the first Canada Warbler we came across, as it was still a lifer for Chris. The 10th of May was a particularly cold one, with no sun and blisteringly cold wind. Both Chris and I were scheduled to lead the morning walks and we were expecting a relatively small number of people to join. Somewhat surprisingly, we had a relatively large group gather, and off we went. The walk was slow for the most part, with a few warblers showing well, most notably Blackburnian and Bay-breasted. We also picked up on an Ovenbird, although only a few of us managed to see it before we lost sight of it. Aside from the warblers we enjoyed the likes of Rose-breasted Grosbeak, Eastern Kingbird, a few showy Swainson’s Thrushes, and a single Veery. Midway along the Estuary Trail a birder kindly let us know that he’d had a Canada Warbler at the end of the trail, and we did not need a second invitation. We scouted the area out, and after a little bit of waiting picked up some movement low down in a few large bushes. 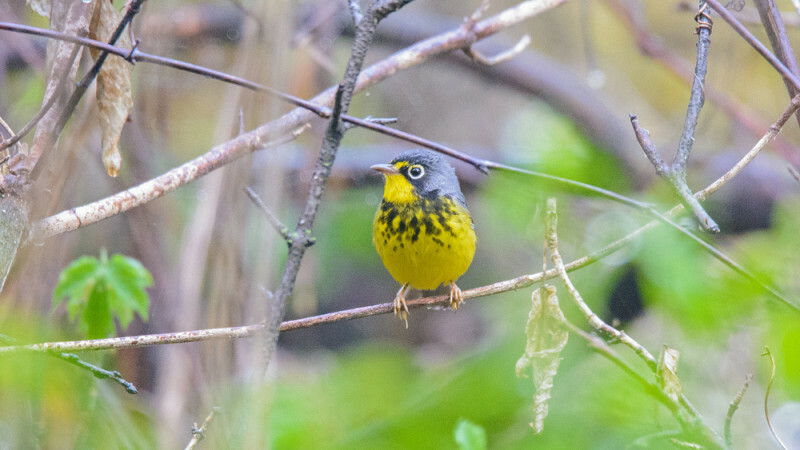 A full-blown adult Canada Warbler proceeded to show on and off for the next 20 minutes, allowing all in our group to get stellar views of this secretive and prized bird. 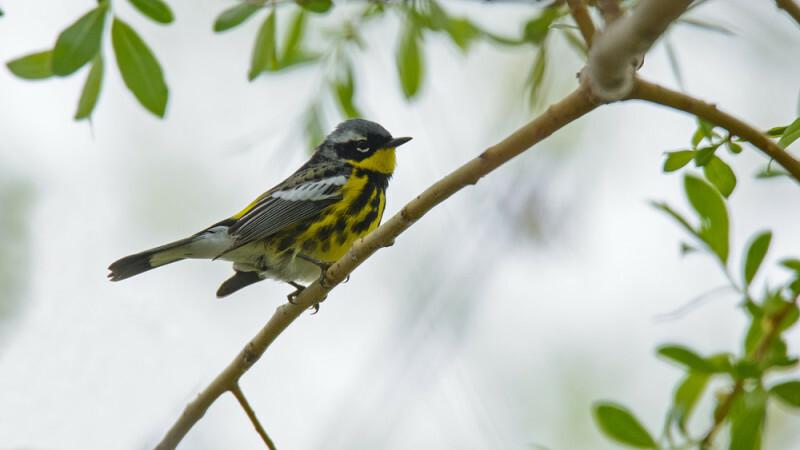 Over the remainder of the festival we did enjoy several more Canada Warblers, although none of them gave as prolonged a view as this spectacular sighting. This sighting was only eclipsed by that of probably the main bird everybody wants to see – Kirtland’s Warbler. Affectionately called ‘Special K’, this species was on the brink of extinction in the recent past, and with some concerted effort has clawed its way back, although it is not in the clear yet. Notorious for causing blockades, the species’ name is spoken in hushed tones, and utter care is taken before this species is called out. With one false call already having happened during the festival, there was some trepidation in our minds when another report came through. To be fair, Point Pelee, on the opposite side of Lake Erie in Canada, had already had a few Kirtland’s showing up, so there were probably a few moving through. 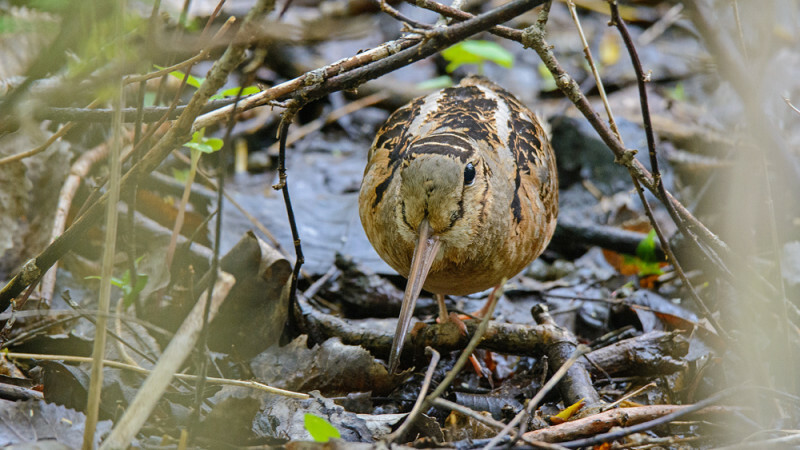 A large crowd of birders had gathered at the sight, and a few photos were circulated confirming the record, although the bird had not been seen in a little bit. We searched for about an hour, becoming even more despondent as time went by, thinking we may have missed it, before eventually caving in to our hunger and quickly departing for some lunch. Naturally, while we were out, a report came through that the bird had been seen again in the same area, and we finished up as quickly as possible before shooting back. After arriving we didn’t have to wait long before the bird popped up right in front of us. It moved around for a minute or two, before disappearing again. What incredible views, albeit brief, but truly spectacular views they were! It took another hour or so before the bird showed again; this time the majority of the large crowd that had gathered managed to get onto it. The views were good, but a bit more distant than earlier, and we had to be content with views in a large tree roughly 75-100 feet away. Many sighs of relief filled the air as the crowd got onto the bird and enjoyed this most highly-prized species! Aside from the wood warblers, Magee also delivered some incredible views of American Woodcock. This secretive and crepuscular species must surely be one of the more difficult-to-see species in the US, and views in any other part of the country are extremely difficult to come by. The birds around Magee, however, have become quite accustomed to people and readily give knock-out views! The resident Eastern Whip-poor-wills showed intermittently, although when they did, it was incredible. 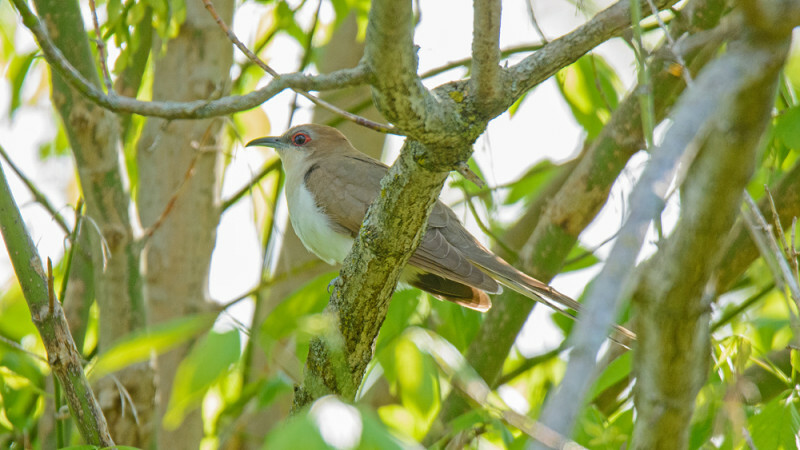 Both Yellow-billed and Black-billed Cuckoos proved difficult customers and weren’t easy to come by. After we had paid our dues, though, we were rewarded with multiple, great views of both these species. Groups of American White Pelicans would entertain a lucky few by flying overhead, while a small group of Snowy Egrets took up residence along the entrance track. Heading back into the woods, sparrows would litter the lower strata, with White-throated and White-crowned Sparrows forming the bulk, and, if you looked hard enough, Lincoln’s, Song, Swamp, and Field Sparrows would materialize as well. The occasional Orchard Oriole would prove a welcome distraction from the many Baltimore Orioles, and if you watched the leaf-litter carefully, various thrushes would hop into view. 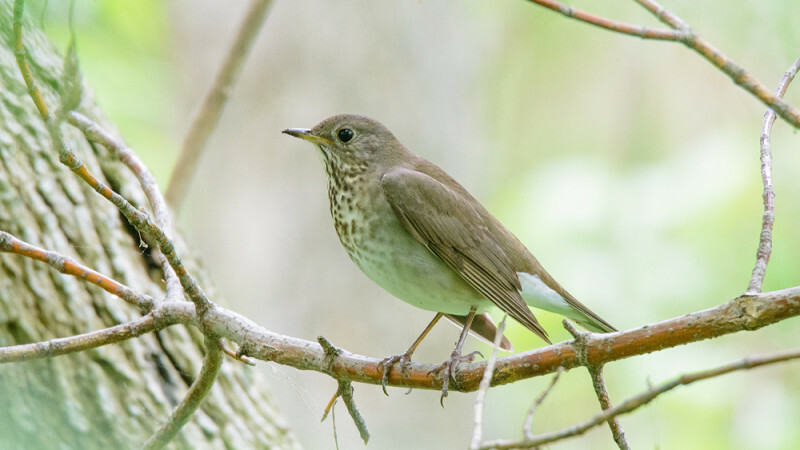 Grey-cheeked, Wood, and Swainson’s Thrushes and Veery would invariable be the culprits. Blue Jays were a daily sight, with groups of varying sizes (some large, others small) moving overhead, in anticipation of making the hop across the lake. Cedar Waxwings would regularly accompany the groups of jays, and occasionally you would find a group of waxwings feeding in a flowering tree, but for the most part they remained rather difficult to get good views of. 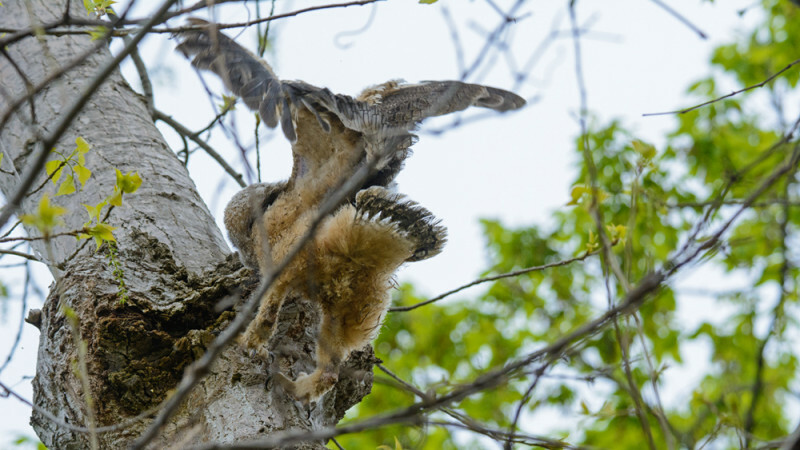 The last noteworthy species seen was that of a young Great Horned Owl. The youngster had been discovered in a little hollow right next to the boardwalk and attracted a steady stream of admirers, as it slowly started the fledging process. The festival drew to a close all too quickly, and our final morning came and went, before we were to make the pilgrimage down south to Columbus. We made two distinct birding stops en route; the first was Bay Creek in Michigan and the second near Oak Openings to look for the Curlew Sandpiper that had turned up. I know you’re thinking, why did we head north into Michigan when we were supposed to be heading south? 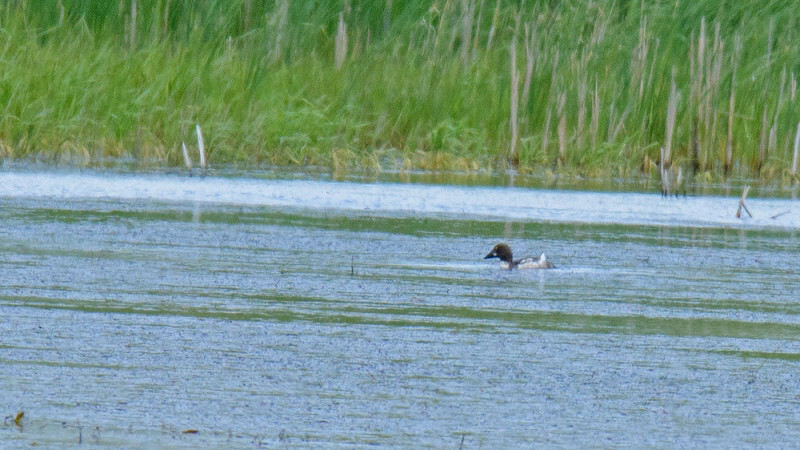 Well, the answer was simple – Common Goldeneye. It was a species I had dearly wanted to see, and although it wasn’t a breeding male, any Goldeneye would do, and so we approached Bay Creek, not really knowing where exactly to go. Our first stop clearly wasn’t right, as the water was so far off you could just see black specks on the water. We continued a bit and found a pond real close to the road, stopped, and began scanning. The pond was loaded with waterfowl, with American Wigeon, Gadwall, Wood Duck, Pied-billed Grebe, and our target, a non-breeding Common Goldeneye. With that under our belt we turned around and headed south, first stopping off to try for the Curlew Sandpiper near Oak Openings. The weather had seemingly turned south as well, with low clouds covering the sky and a strong, freezing cold wind blowing. We stopped at the flooded field and joined the birders who were already gathered there. The bird had last been seen a few hours earlier, when it had flown with some other waders seemingly into one of the other nearby fields. We spent a bit of time working through the shorebirds gathered here, and indeed the Curlew was absent. 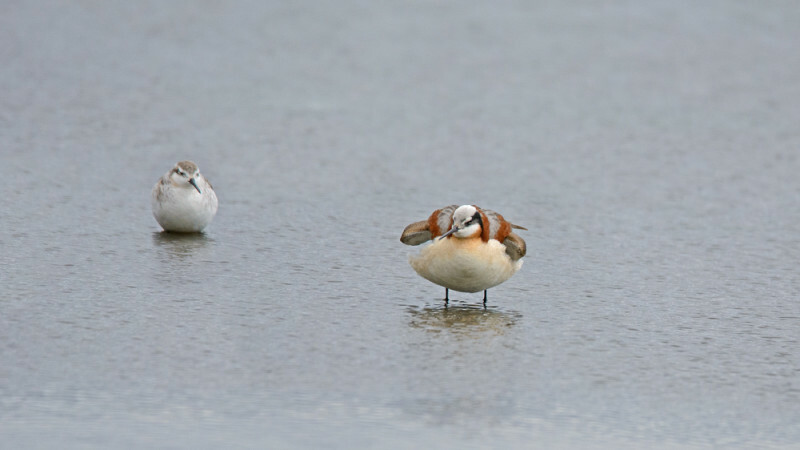 In its place, however, were a plethora of other shorebirds. 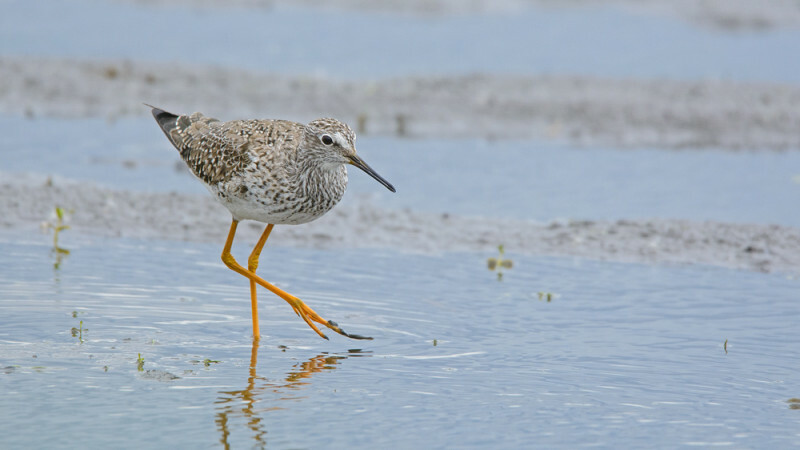 A lone Greater Yellowlegs stood together with many Lesser Yellowlegs, and Dunlin and Short-billed Dowitchers made up the remainder of the bulk of the birds. A lone Semipalmated Sandpiper foraged with a group of four White-rumped Sandpipers – the bigger White-rumped bullying the little Semipalmated and regularly chasing it away. 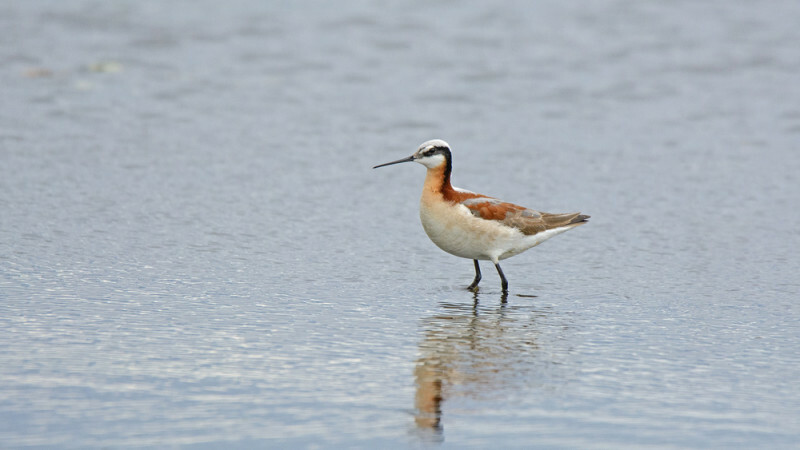 However, a breeding-plumaged female Wilson’s Phalarope definitely stole the show with her vivid and rather incredible colors! The much drabber male lurked in the background, seemingly in complete awe of her. While scanning through the rest of the field, we picked up large numbers of Semipalmated Plovers along with numerous Buff-bellied (America) Pipits and a few Horned Larks, but nothing resembling a Curlew Sandpiper. We eventually headed off to scout out the surrounding fields, and after a few fruitless loops around conceded defeat and began the drive back south, where we rounded off the Biggest Week with an outstanding dinner with some good friends. Our American birding tours can be found here.